Wheelersburg captains Xander Carmichael, Bryson Keeney, Alex George, and CJ Hall come to the middle of the field for the coin toss. Wheelersburg’s Trent Salyers drops back to pass against Middletown Madison. CHILLICOTHE – Hernstein Field was rocking on Friday night. 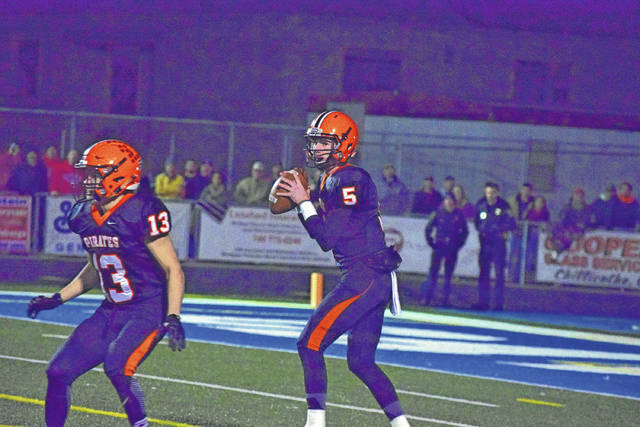 As the Wheelersburg Pirates took on the Madison Mohawks for a state championship berth, both stands were full and there was nearly no standing room as spectators witnessed an epic battle. The atmosphere was certainly one to behold, and a big stage was set between the two schools. Fans piled in hours before the game kicked off, and were rambunctious throughout. Despite all the energy from the crowd, the Pirates took a couple quarters to wake up. The Mohawks scored a touchdown right before the end of the half on a short run to take a 7-0 lead into the break after a Salyers interception. Still, Wheelersburg and head coach Rob Woodward weren’t wagering. Woodward knew his defense was dominant, just as it has been all season. Several times Madison was in Pirates territory in the first half, but came up with just seven points to show for it. The halftime speech from Woodward to his team was to keep at it. Against Columbus Academy, Wheelersburg trailed 13-0 at the break before rallying to a 35-16 victory. A big part of that was reverting to more of a run-oriented attack, which the Pirates utilized in the second half against the Mohawks as well. Things didn’t change right away for Wheelersburg, however. Madison was able to add a field goal to take a 10-0 lead in the third quarter. The Pirates would answer with a Jalen Miller field goal in the same frame, but the Mohawks defense was standing tall late into the third period. Trailing 10-3, the Pirates caught a big break when Madison bobbled a punt and was stopped short of a first down. 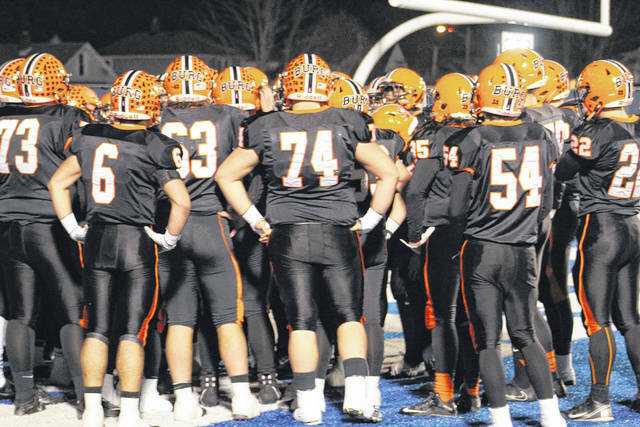 Wheelersburg would take over at the Mohawks’ 21-yard line, and cash in. Trent Salyers found receiver Justin Salyers on a 3rd down and 5 from 17 yards out on a beautiful play action pass to pull the Pirates closer. Trent wasn’t so sure his throw to Justin was going to wind up going for a score, though. However, the extra point was missed by Miller and Wheelersburg was still behind 10-9 with around 10 minutes to play. 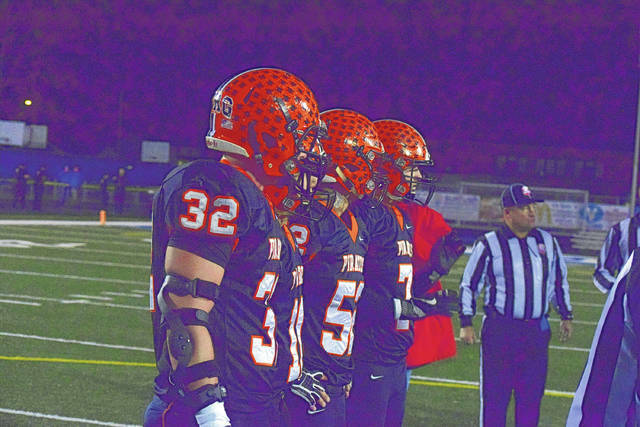 Yet, the Pirates defense was jacked up and forced a three-and-out to give Wheelersburg’s offense the ball back. From there, Salyers found his favorite target Tanner Holden on a gorgeous 35-yard pass to put the Pirates inside the five-yard line. Several plays later, Carmichael banged out the go-ahead touchdown from the wildcat formation from three yards out to put Wheelersburg ahead for good, 15-10. The two-point conversion try was stopped, but the Pirates had just enough juice to stay the course and claim their treasure of a state championship appearance. Holden and Cole Lowery recorded interceptions in the final minutes to seal the deal, and Wheelersburg went on to win. Carmichael cites that game against Columbus Academy as one that helped the Pirates play their best and get the win over Madison. Salyers was psyched about earning a spot in the state title game. Although none of the current members of the team were alive the last time Wheelersburg played for a state title, they sure know their history. Thought they’ve come this far, Salyers says there’s still some work to be done. If the Pirates can put in that work, they could be claiming another state championship. Wheelersburg (14-0) will play Pemberville Eastwood (14-0) at Tom Benson Hall of Fame Stadium in Canton this Friday at 3 pm.